Things are never really quiet here in Open Lab. And since we’re part of that buzz, things never really stop developing with us at fempower.tech either. Recently, we’ve been trying to do a little more for ourselves in the lab. As part of that we’ve got an on-and-off writing group to help us all get stuff done. It’s a place to work on whatever writing we need to get done, and isn’t really focused on anything. Out of this writing group, and with the CHI deadline coming up soon (well, it’s a few months away, but better start early to not get too stressed, right?) we realised we actually don’t know too much about each others’ work! So, we’ve decided to try something new. 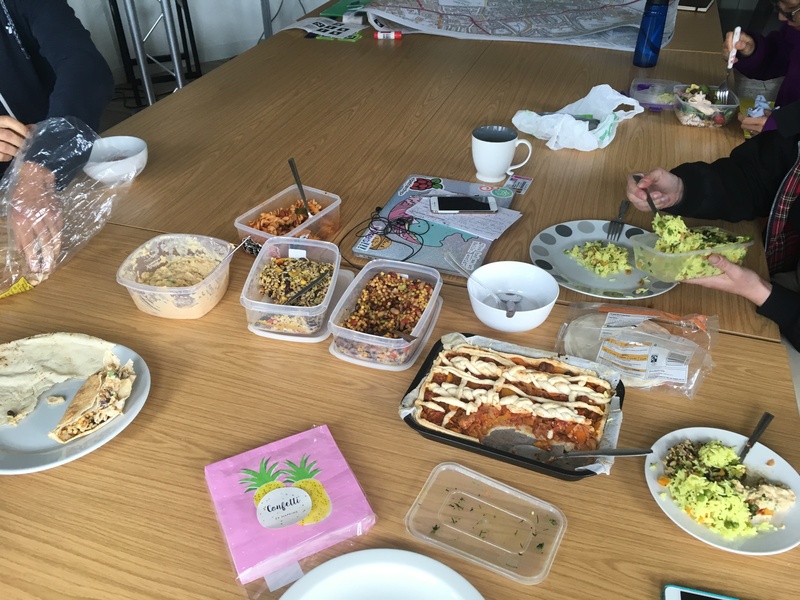 Quite a few of us in the group like cooking and baking, and food is generally a great way of getting people to come together, so we decided to host a pot-luck! We simply scheduled a lunch hour (12-1pm) on a Wednesday and invited everyone on our mailing list to come along. We asked everyone to bring along some questions, thoughts, ideas, and food to share. The idea was to sit round a table to share food and stories. To talk to each other about our work and learn more about what each of us is doing. Since we’re coming up to the CHI deadline, we also used this as a chance to ask for help for things we want to write for CHI this year. The spread of the first fempower.tech writing support pot-luck was pretty delicious! 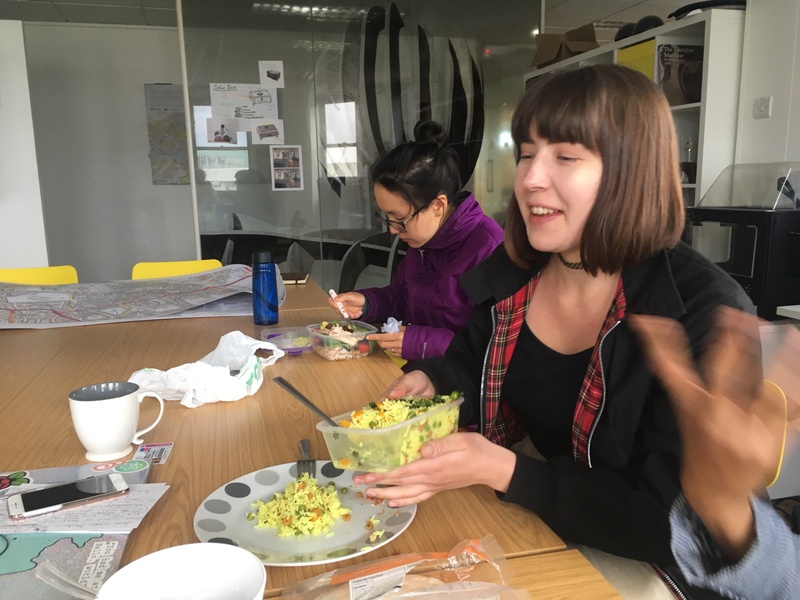 We had some lemon and peanut rice, all sorts of different vegetarian salads, some pasta, a pie, and homemade hummus! All of it was delicious. We did spend a lot of time talking about how delicious all the food was and asking for some of the recipes, but we also talked about work-related things. It was great to sit together and conversations quickly turned to what we could do to make our writing and working experiences in the lab better. What we could do to make the chi-writing process more supportive, and how we can make fempower.tech more visible in the lab (since we’ve not been great at that since we started our group over a year ago). When we initially organised the event, we thought this would maybe be a one-off event, but it seems to have been a catalyst of something slightly more. We’re going to have monthly pot-lucks in the lab that anyone who wants to bring some food is welcome to. The aim is to share stories and experiences of our work, but also to just come together to have delicious food and a natter. So, here’s to more of these fempower.tech lunches and the sharing of fun little ideas that help make the workplace a more welcome and inclusive space!